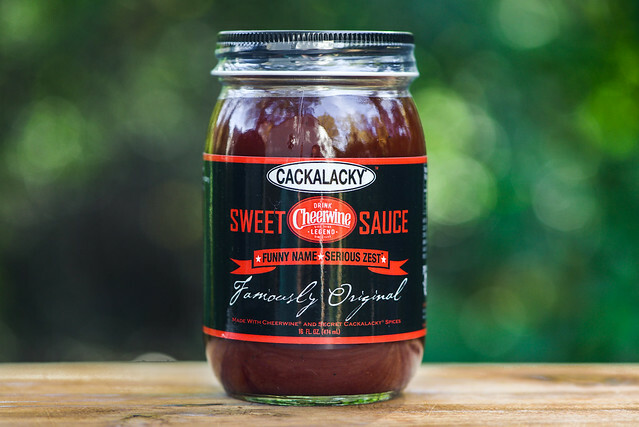 A true North Carolina marriage, this sauce brings together beloved Cheerwine soda and Cackalacky Spice Sauce to create something wholly unique in the crowded field of barbecue sauces. 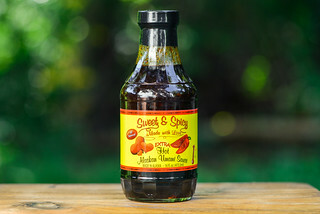 This sauce is the brain child of Caroline and Page Skelton, who developed their Cackalacky Spice Sauce back in 2001 and collaborated with other North Carolina rooted brands since then to extend their offerings. Cheerwine, a cherry-flavored soda created in 1917 in Salisbury, is probably their most ubiquitous NC effort to date, transforming this beloved local drink into a wholly unique grilling and dipping sauce. 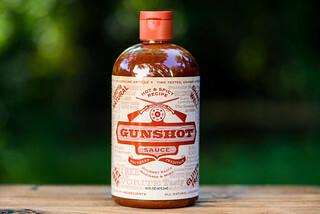 You get the clear aroma of cherry syrup on first whiff of this sauce. It's not all sweet soda though, there's a nice barbecue complexity that balances out the prominent sweet, artificial fruitiness. In particular, there's a mellow Worcestershire depth, slight oniony notes, a smokiness, and a pretty well defined tang. One thing not present in the aroma is heat—this sauce smells almost all sweet through and through. 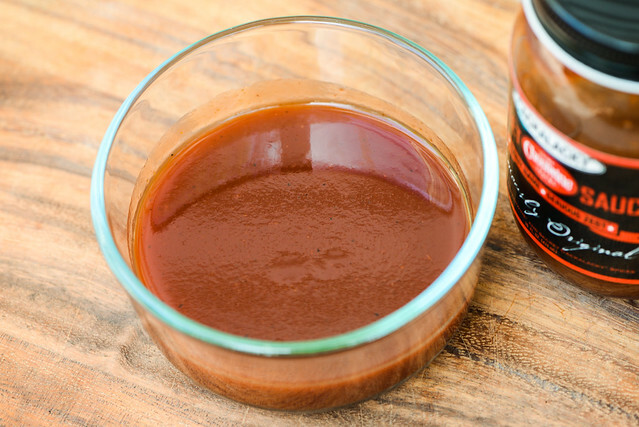 This glossy, rusty orange sauce runs medium thin in thickness. It's semi-transparent, which lets you see the light peppering of black and red spice specs throughout. It has a very quick, steady pour off a suspended spoon which ends with a few fast drips and leaves a thin coating of sauce left clinging to the silverware. First taste of the sauce is a spoonful of sugar. 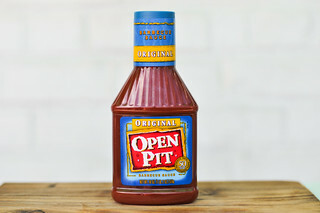 Quickly though, the distinct cherry syrupy flavor comes in, which is a surprising component to taste in barbecue sauce. Soon after that, a barbecue complexity begins to build. There's a very mild molasses flavor that adds body of the sugar, then a bit of onion, followed by a mild tang and a light hit of Worcestershire sauce. As the sauce settles, the tang intensifies and a nice kick of heat imparts a little tickle on the tongue. This leaves the final aftertaste primarily spicy and sour with a lingering cherry sweetness mixed in as well. The sauce first coated the chicken in a thin, even layer. It baked down very well over indirect heat, and built up a better sauce layer after multiple brushings. 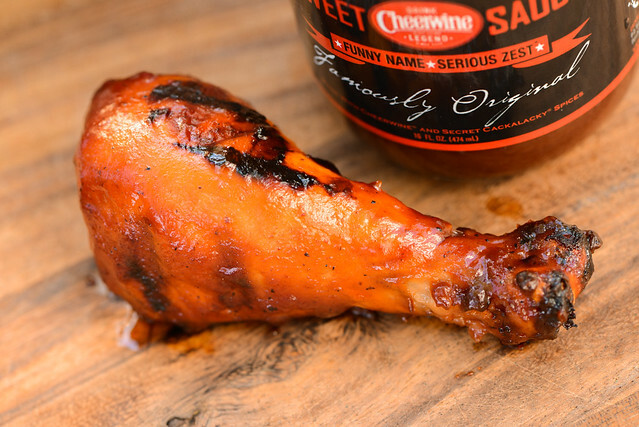 When moved to direct heat, the sauce suffered minor burn off and a bit of burning, leaving a small blackened patch on the leg. The barbecue complexity the sauce had out of the jar was greatly diminished after being cooked, leaving the chicken with a very prominent sweet cherry syrup flavor. There was still a bit of tang in there, but the nuances of the spices and heat were almost existent. I have start by admitting I'm not quite yet a full Cheerwine convert. I never had it prior to moving to Durham, and would still pick Cherry Coke over Cheerwine when presented the option at a soda fountain. That being said, I was surprised how much I liked the sauce out of the jar. It certainly wore its Cheerwine badge proudly, but contrasted that intense soda sweetness with good barbecue footings by way of vinegar, Worcestershire, and pleasant heat. Unfortunately, that balanced tipped too far into the Cheerwine syrup only territory after being cooked, and while I wrote in my notes that it wasn't a bad flavor, I was left questioning if this is what I wanted my barbecue to taste like. Of course, you can balance that overpowering cherry sweetness out by way of a rub, which left me seeing an area of hope for a sauce that is certainly more unique than most out there.